Sometime we need external tools to list our day to day tasks mostly when work for the SQL Server as it does not have any built in features with previous version. We can follow the priority and sequence of the tasks from the list and also can have an idea of the our current or future tasks from the list with the tool. So the problem is how can we manage the tasks without using external source? SQL Server Denali coming up the new feature for the above solution. It's a Task List. 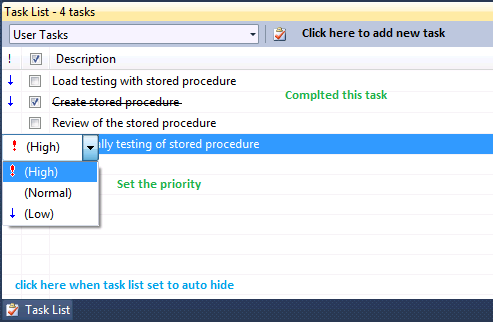 You can open task lists from the View --> Task List or Ctrl+\,T. It will appear as follows. We can add new tasks to list, set the priority and complete the tasks in the Task List. Here is an image which demonstrates all the things. With this window, you can create a new list, define priorities & categorized as well, also can close tasks after completion. Do you start to use it with Denali? Start list your SQL server tasks using this feature. So please play with this new feature and share your experience here.